This Unbelievable Tool Is Now At The Disposal Of Madmen! According to this new story from Mac Slavo over at SHTFPlan, one of the most dangerous experiments that mankind has ever embarked upon is DARPA’s desire for gene drive technology. Warning us within his story that scientists now have the knowledge and the tools they need to create and deliver “Doomsday genes” which can selectively target and exterminate an entire species, DARPA recently announced that they will be spending tens of millions of dollars on 'genetic extinction research' with the official aim of this research being 'fighting harmful insects'. While many might ask, what exactly is 'gene drive technology' and 'why is it so dangerous', we see one of the answers in this recent story from Technology Review titled "If Unleashed in the Wild, Gene Drives Could Create a 'Highly Invasive Species'”. With researchers warning "Technology’s answer to invasive species and disease-spreading insects is looking riskier than ever in its current form", we see that gene drive technology evolves from CRISPR technology, the 'editing' of DNA almost as if it were simply a film strip being edited as seen in the graphic above. Yet as Joseph warns, this kind of technology in the hands of madmen could wipe us out as a species. 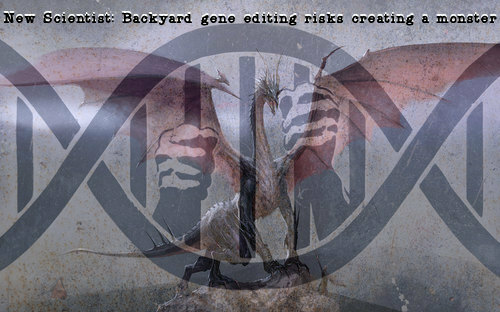 As the website New Scientist reported back in March of 2017, "backyard gene editing risks creating a monster" with biohackers already signalling their intention to use CRISPR, which poses a big problem for the authorities. Aside from astonishing cures, one of CRISPR’s most tantalizing uses could be so-called gene drives. As we’ve reported in the past, the technique can be used to easily insert fertility-reducing genes into the DNA of disease-carrying insects or invasive species (such as the humble starling in the U.S., were we so inclined). That would systematically wipe them out. Applied to mosquitoes, the technology could fight malaria and Zika. Targeted at interloping animals, it’s been suggested as a means of preserving fast-declining species in New Zealand. But the trick is obviously not without its risks. As we’ve explained before, the wholesale removal of a species from a geographic region might be useful, but it’s easy enough to imagine the technique getting out of control, spreading further than intended, and transforming entire ecosystems in ways it wasn't meant to. Back in December of 2015, Steve Quayle linked to this story from Motherboard titled "Someone Will Eventually Use CRISPR to Try to Make a Dragon or Unicorn" while leaving this self-explanatory SQnote: "I’d like to remind everyone that dragons are not vegans!" And while CRISPR created dragons or unicorns might be a bit further away than happening within the next year, we remind you that during the Obama administration, the long standing moratorium banning human beings from creating human hybrids or 'chimeras' was lifted according to this June story from Futurism. 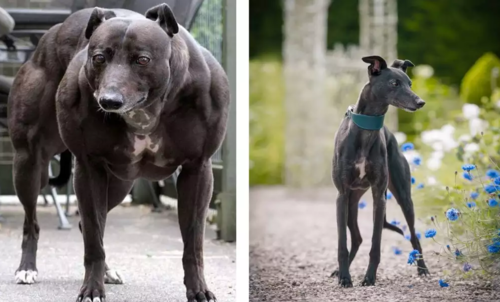 While this May 30th story from the Columbia University Medical Center reported that CRISPR gene editing can cause hundreds of unintended mutations, we can see some of the intended results in the creation of 'super dogs' in China where they've already successfully used “gene editing” to create two beagles with twice the muscle mass of a regular dog, and plans are already being made to increase their size, intelligence, and even eliminate diseases. And we probably shouldn't be surprised when we read that earlier this year, The Bill and Melinda Gates Foundation paid a PR firm called Emerging Ag $1.6 million to recruit a covert coalition of academics to manipulate a UN decision-making process over gene drives, according to emails obtained through Freedom of Information requests. As the Independent Science News story reports, Gene drives are a highly controversial new genetic extinction technology. They have been proposed as potentially able to eradicate malarial mosquitoes, agricultural pests, invasive species, as well as having potential military uses. As the website Science asked on December 11th, "is there really a covert manipulation of U.N. discussions about regulating gene drives?" Why would the Gates Foundation attempt to cover up such discussions with the UN? 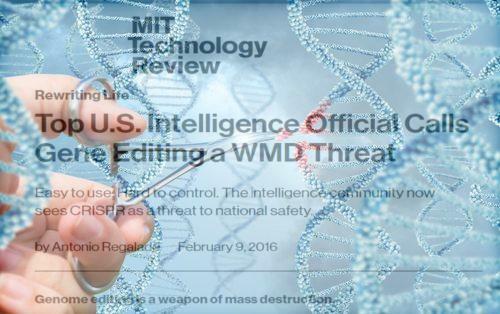 While this February of 2016 story from the MIT Technology Review reported that top US intelligence officials have labeled the easy to use gene editing technology a "WMD threat", their story helps to explain why they feel its such a threat. Gene editing refers to several novel ways to alter the DNA inside living cells. 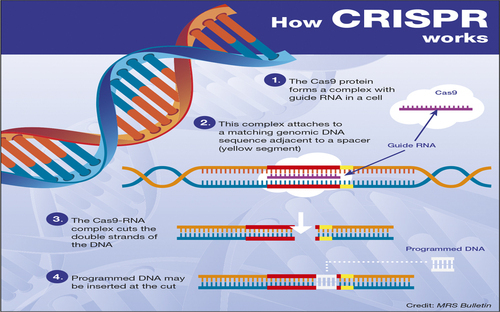 The most popular method, CRISPR, has been revolutionizing scientific research, leading to novel animals and crops, and is likely to power a new generation of gene treatments for serious diseases. Clapper didn’t lay out any particular bioweapons scenarios, but scientists have previously speculated about whether CRISPR could be used to make “killer mosquitoes,” plagues that wipe out staple crops, or even a virus that snips at people’s DNA. With the US military and DARPA now heavily investing in 'doomsday genetic technologies' and concerns that an accident or planned event could create irreversible conditions that could possibly lead to the extinction of the human race, the creation of dragons or unicorns might seem like small potatoes when comparing them to the 'worst case scenario' of human extinction. And shall the future take us down that road we'll just need to remember, dragons are not vegetarians!